We have several scales kits just for helicopters and light weight rotary wing aircraft including UAV and UAS applications. We have top of jack and platform sets and we support many OEM applications as well as custom build kits to specification. Large Bell 4 jack, 4 cell requirement? Go wireless with our HH2400-4-10CS helicopter weighing kit. No more wires! Super friendly and easy to use! All channels read on our hand held wireless transceiver. $7995.00 complete with NIST traceable calibration, ready to use as received. Top of jack mount, check your jacks for the interface, if you do not have the mounting hole, we sell optional adapters. 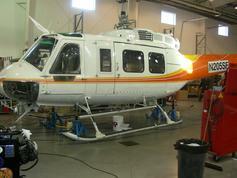 Bell 407 on our wireless helicopter scale kit, easy to use and now wires! This kit is our three cell lap top version M2400-3-10CS for $7295.00 or our HH2400-3-10CS is our hand held version for the same price. 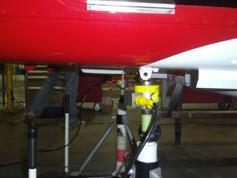 Bell 407 rear jack point on our wireless system. If you need to weigh your Bell helicopter, we have a set of scales for you. We offer our HH2400-3-5CS which has three 5,000 lb top of jack mount handheld wireless load cells, or our HH2000-3-10CS which has three 10,000 lb top of jack wireless load cells. Both kits offer the same standard configuration with three channel handheld indication or you can have our M2400 series laptop computer version, both are the same price. Need to weigh your Jet Ranger? We have our M2000-3-5CS and M2000-3-10CS standard hard wired kits as well as our M2400 wireless helicopter weighing kits. 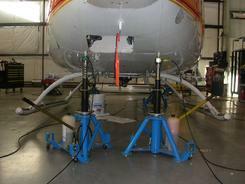 We now sell Meyers Hydraulic jacks for the Bell Jet Rangers on High Skids. Weighing needs, skid maintenance needs, shoe replacements or other maintenance, we have every thing you need. Many EMS, Law Enforcement and Commercial 135 operator use our equipment, it is simple to use, cost effective and as you can see on this web page, we have cell kits for most all the Bell products. Here you can see our standard top of jack cell mounted with an adapter on a Meyers jack. We have every thing you need to weigh your Jet Ranger on High Skids. We carry Meyers jacks, adapters and our M2000-3-10CS kit. It is one stop shopping, if you have any questions just call us, we are here to help. We now sell Meyers Hydraulic Jacks, Shown here you can see the jack, our adapter and our 10CS cell in place getting ready to weigh. Call us at 561-281-6179 for a full quote on weighing kits, adapters and jacks.